If Jesus is your boss and you call off fake sick, will he forgive you? 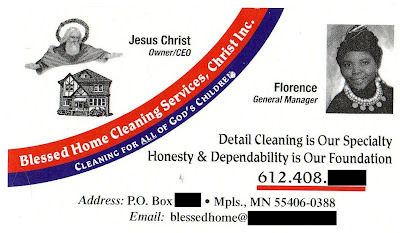 Have you accepted Jesus Christ as your personal cleaner? If you go into the dirty bathroom and say, "It smells like someone died in here," would Jesus turn to you and say, "Sorry, that's me." Jesus would forgive you for your hubris in using his name to promote your business. I doubt he'd approve, but he would forgive. Yow. That's a nice idea that is in really bad taste.